Background: Polypharmacy is now a frequent aspect and reality of current medicine practice, driven by managing multiple comorbidities, especially in older adults. However and unfortunately, polypharmacy can expose patients to adverse drug reactions, and drug-drug or drug-disease interactions. On the other hand, clinicians are often hesitant to add new drugs to complex regimens even when recommended by evidence-based medicine and guidelines. In addition, there is frequently a failure to assess which medications might not be beneficial and may therefore be stopped. Method: Cardiovascular disease prevalence is increasing despite the efforts to prevent this with pandemics of obesity and diabetes as leading causes. The healthcare system is facing an increasing number of cardiovascular diseases in older patients with multiple comorbidities. New cardiovascular guidelines encourage multiple drug use to control these conditions and improve mortality and morbidity. However, use of multiple drugs can lead to inappropriate drug interactions and increased adverse outcomes. On the other hand, the so-called polypill has been proposed as a means to decrease the burden of multiple medications as well as increase cardiovascular disease prevention. 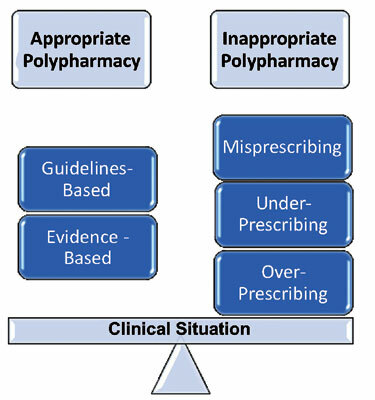 Conclusion: This review discusses multiple issues of polypharmacy and its challenges, with a focus on cardiovascular diseases. Polypharmacy, cardiovascular medicine, polypill, cardiovascular disease, drug interactions, comorbidity.